Objectives: This clinical trial evaluates the efficacy of different pit and fissure sealant modalities as a caries prevention tool. 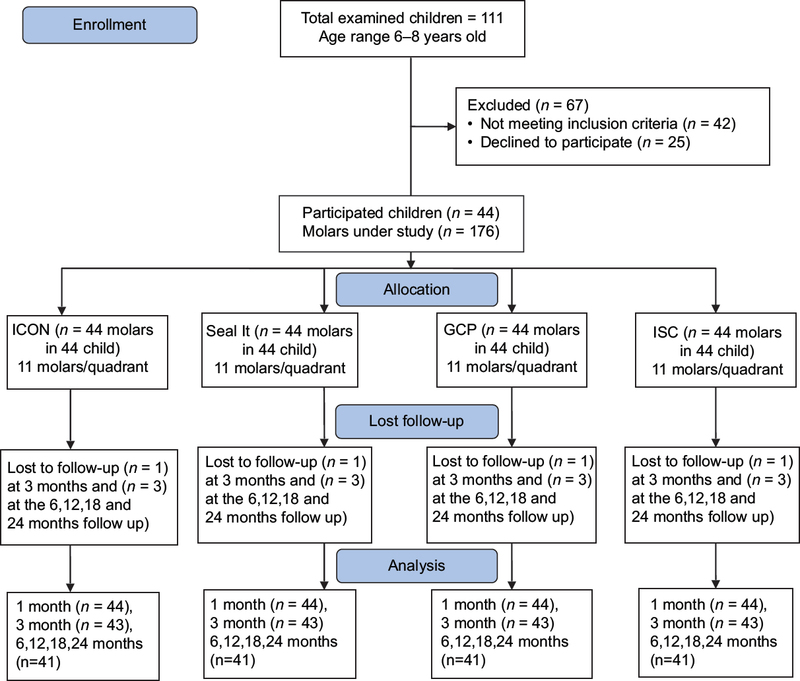 Materials and Methods: Forty-four children aged 6–8 years with completely erupted first permanent molars participated in sealant placement randomized clinical trial. Split-mouth technique used and each child received four treatment modalities (ICON, Seal It, GCP glass seal, ICON/Seal It combination). Caries progression and sealant retention monitored over a period of 24 months. Results: Seal It and combination modalities had the highest efficacy in the prevention of pits and fissures caries, whereas the ICON had the lowest efficacy. Regarding retention, there were no significant differences among the four modalities during the 1, 3, and 6 months follow-up intervals. However, at 12, 18, and 24 months, the retention of Seal It and combination modalities were better than ICON and better than GCP, but the differences were not statistically significant. In addition, the retention of combination modality was better than Seal It, but the difference was not significant. At the end of the trial, the caries incidence was the highest in ICON group (20 lesions) followed by GCP group (13 lesions), Seal It group (3 lesions) and the lowest observed in combination group (2 lesions). Conclusions: Both Seal It and combination modalities are highly effective in the prevention of pits and fissures caries, GCP has acceptable effect while the use of ICON alone was not effective. The Seal It and ICON combination improves their clinical efficacy in caries prevention. The pits and fissures at the occlusal surfaces of molars are retentive areas for food debris and dental plaque, these areas are at an increased risk for development of dental caries because of their complex nature. Children present greater risks for dental caries due to their highly cariogenic diet, teeth erupting phase, and deep pits and fissures which favor retention of food debris and dental plaque; hence, its prevention is important for these age group. Glass ionomer sealants considered very effective for sealing newly erupted permanent molars; they are hydrophilic and less sensitive to moisture during their application and they accomplish good adhesion, chemical incorporation, and release of fluoride. In case of partial loss of glass ionomer, there is no evidence of indicated failure and inefficacy since part of the material remains trapped in the bottom of the fissure, releasing fluoride, and preventing caries. The infiltrant technique has certain advantages such as the absence of margins on the tooth surface that could promote dental plaque accumulation and may enhance the susceptibility to recurrent dental caries. It also strengthens the lesion mechanically, thereby preventing rapid destruction. Different in vitro studies have carried out to evaluate the penetration of resin infiltrant and a conventional sealant into pit and fissure carious lesions. Based on these studies, resin infiltrant leads to more deeply infiltrated lesions, which might, in turn, result in increased resistance to caries progression., The manufacturers of this new product claim that it is a micro-invasive treatment of the early carious lesions and can penetrate several hundred micrometers deep into natural carious lesions, when employed as per manufacturer's instructions. This technique can be an alternative to other noninvasive strategies already in practice to manage initial carious lesions. Resin infiltrant has the mechanical ability to prevent further demineralization, preserving healthy tooth structure, and excellent patient's acceptance. Prajapati et al. evaluated the effectiveness of resin infiltration on artificial carious lesion by assessing the depth of resin penetration and the change in microhardness of carious lesion after resin infiltrant application, they observed that, the mean depth of infiltrant penetration was 516.8 μm. There was a significant increase in Vickers hardness number values of demineralized lesion after resin infiltration. Kielbassa et al. assessed the infiltration capability and the rate of microleakage of a low-viscous resin infiltrant combined with a flowable CR (RI/CR) when used with deproteinized and etched occlusal subsurface lesions. This combined treatment procedure has compared with the exclusive use of flowable CR for fissure sealing. They concluded that carious lesions had not infiltrated with flowable CR while uniformly infiltrated to a substantial extent with (RI/CR). Furthermore, microleakage and the occurrence of voids had reduced in the RI/CR group when compared with the CR group. The RI/CR approach enhanced the initial quality of fissure sealing and recommended for the clinical control of occlusal caries. The efficacy of different pit and fissure sealants normally depends on the adhesion and the retention of the material. Thus, throughout the development of new sealing materials focus remained on the improvement of the retention; resulting in the change in the recommended conventional etch- and rinse procedures. However, continuous improvement in these materials, the loss of retention is still an observed problem. There is no enough scientific evidence about the efficacy of resin infiltrant as a pit and fissure sealant. No consensus exists about its common use in clinical practice. In addition, in vivo investigations on prevention of pits and fissures caries efficacy of different commercially available sealant materials are limited. Assuming the infiltrant diffuses deeply in micropores of etched enamel and non cavitated carious lesions. The present study designed to evaluate the efficacy of resin infiltrant (ICON) and compare its efficacy in prevention of pits and fissures caries with two commercially available and clinically recommended fissure sealants and also to evaluate its efficacy in combination with nanoparticle resin-based sealing materials, to overcome the disadvantages of infiltrant and render the advantages of nanoparticle resin sealing materials. Compare the efficacy of different pit and fissure sealants modalities used for the prevention of pit and fissures caries in vivo. The present clinical trial has carried out at the dental clinic of Pediatric, Dental Public Health and Preventive Dentistry Department after obtaining the ethical approval (IRB number 149-2015) from Institutional Ethical Committee, Faculty of Dentistry, Mansoura University, Egypt and trial registration number ISRCTN15306760. The trial was composed of four groups of first permanent molars of school children aged 6–8 years. The study carried out in a split-mouth design and the groups named according to treatment modalities as illustrated in flow diagram [Figure 1]. The specific target of the study was the pits and fissures of first permanent molars. By calculation of the sample size at confidence level 95% and confidence interval of 5% and expected percentages of pits and fissures caries prevention of 70%, the estimated sample was (156) which increased to (176) molars. All molars had sound, non cavitated Grade 0, 1, or 2 caries according to the International Caries Detection and Assessment System (ICDAS) caries diagnostic criteria. A total of 111 children, aged 6–8 years, from three primary governmental schools were examined after obtaining written informed consent from school authorities. Detailed consent forms which illustrating the importance of pit and fissure sealants for caries prevention and the application procedure sent to parents of 69 children who have the selection criteria. Consent forms signed by the children's parents with agreement to participate in the present study obtained from 44 children (25 boys + 19 girls) who formed the study group. Three different pit and fissure sealant materials had used in the present trial. GCP glass seal; it is nanoparticle glass ionomer-based pit and fissure sealant (GCP Dental | First Scientific Dental GmbH, Elmshom, Germany. Product no: 20200). Treatment modality number 4 (ICON and Seal It combination group). Every child received the four treatment modalities (one modality/molar), each material was used for the treatment of 44 molars (11 molars in each quadrant). The four treatment modalities had written on 44 cards. The children asked to pull a card randomly from a basket under the supervision of the researcher. The well-trained and calibrated external examiner who was blind to study design and materials used did the clinical examination and evaluation of sealant retention. The collected data were analyzed using an external statistician. Two investigators and external evaluator carried out the present study. The intra-examiner consistency of measurements before and during the study confirmed through training and calibration of the external evaluator. The inter-examiner consistency performed between the two investigators and the external evaluator, calibration tested by Kappa test, the inter-examiner and intra-examiner consistencies were 86% and 88%, respectively. For ethical reasons, all participants with dental problems referred for necessary treatment in dental clinic of Pediatric Dentistry Department, Faculty of Dentistry, Mansoura University. Baseline scores and follow-up examination of dental caries in pits and fissures of molars under the study recorded according to ICDAS criteria. All materials used to seal pits and fissures with strict adherence to individual manufacturer's instructions including slow speed handpiece for cleaning of the surface with fluoride free pumice/water slurry, cotton roll isolation, etching agent, and fourhanded technique application. The pits and fissures etched with 37% phosphoric acid gel for 30 s, oil-free air and water sprays used for 20 s to completely rinse the acid and dry the teeth. The sealant was placed over the pits and fissures areas, cured under the light cure for 30 s (430–490 nm, 600 mW/cm2) using light-emitting diode (LED) light (Ivoclar Vivadent, Liechtenstein, Germany). The targeted molars treated with ICON caries-infiltrant following the manufacturer's instructions, ICON usage involved the application of ICON-Etch syringe (15% hydrochloric acid) for 2 min, followed by rinsing with water for 30 s and drying with oil-free and water-free air. The etched surface then desiccated using the ICON dry syringe (99% ethanol) for 30 s followed by drying with oil-free and water-free air. ICON-Infiltrant syringe placed on the targeted surface and caries resin-infiltrant dispensed. After 3 min, excess infiltrant was wiped using a cotton roll and the surface was light-cured (430–490 nm, 600 mW/cm2) for 40 s. Finally, the infiltrant reapplied for 1 min and light cured for 40 s.
The targeted molars treated with the ICON infiltrant and subsequently the application of Seal-It followed. The application steps were as illustrated above. The sealant retention and dental caries on the occlusal surface evaluated at different recall visits following 1, 3, 6, 12, 18, and 24 months. Sealants retention were evaluated according to a modified version of the color, coverage and caries sealants evaluation system. Dental caries evaluated using mouth mirror and blunt probe at all follow-up intervals. The same external examiner who blinded to the study design evaluated caries incidence and sealant retention. The sealants retention was classified into 4 scores: score A = sealant is present in all the fissure system; score B = sealant is present in >50% of the fissure system; score C = sealant is present in <50% of the fissure system; score D = absent sealant. During evaluation intervals, the presence of dental caries was assessed according to ICDAS criteria and the grades 0, 1, and 2 were recorded while score 3, 4, 5, and 6 were recorded as one category named other grades more than Grade 2. At the end of the trial, in the event of new caries development and sealant failure, the fissures were either resealed or restored. The collected data were organized, tabulated, and statistically analyzed using SPSS software statistical computer package, version 22.0. (IBM Corp., Armonk, NY, USA). The collected data presented as frequencies and compared using the Chi-square test. The differences among the different groups considered statistically significant at P ≤ 0.05. The comparison of sealant retention among different sealant modalities during different follow-up intervals indicated that there were statistically nonsignificant differences among the four treatment modalities at 1, 3, and 6 months follow-up intervals (P = 0.098, 0.581, and 0.385, respectively). On the other hand, there were statistically significant differences among them at 12, 18, and 24 months (P = 0.002, 0.010, and 0.000, respectively) [Table 1]. The comparison of caries incidence among the four groups indicated that there were statistically nonsignificant differences among them as regards the distribution of ICDAS grades at baseline (P = 0.787), there were no new carious lesions in all Groups at 1 and 3 months. There were statistically nonsignificant differences among them at 6 and 12 months (P = 0.108 and 0.305), whereas there were statistically significant differences among them at 18 and 24 months follow-up intervals (P = 0.004 and 0.000) [Table 2]. Multiple comparisons at different follow-up intervals between every two sealants modalities (Seal It vs. ICON, Seal It vs. GCP, Seal It vs. combination, ICON vs. combination, ICON vs. GCP and GCP vs. combination) concluded in [Table 3]. All the four modalities have comparable efficacy as regards sealing retention scores and new carious lesions at the first 6 months; however, differences are evident at the late follow-up intervals. The retention of Seal It was better than ICON at 12, 18, and 24 months and the differences were statistically significant (P = 0.001, 0.041, and 0.041, respectively), the number of new carious lesions was higher in the ICON group than Seal It group at 18 and 24 months and the differences were also statistically significant (P = 0.013 and 0.000, respectively). The retention of Seal It was comparable with GCP except at the 12 months interval, where Seal It group showed more retention and the difference was statistically significant (P = 0.011). The number of the new carious lesions was higher in GCP group than Seal It group at 18 and 24 months and the differences were statistically significant (P = 0.039 and 0.010, respectively). On comparison between Seal It and combination, the retention was better in the combination group than Seal It; although, the differences were statistically nonsignificant at all follow-up intervals. Furthermore, the number of new carious lesions was almost similar in two groups at the different follow-up intervals. The retention of combination was comparatively better than ICON, and the differences were statistically significant at 12, 18, and 24 months (P = 0.006, 0.000, and 0.001, respectively), the number of new carious lesions was greater in ICON group than combination group at 18 and 24 months intervals and the differences were also statistically significant (P = 0.003 and 0.000, respectively). The comparison between ICON and GCP showed the retention scores were comparable at all follow-up intervals, and there were no statistically significant differences between them; the number of new carious lesions was higher in ICON group than GCP group at 18 and 24 months intervals, but the differences were statistically nonsignificant (P = 0.599 and 0.203, respectively). On comparison between GCP and combination, although the retention of combination was much better than GCP, the differences were statistically nonsignificant except at the 24 months (P = 0.036), the number of new carious lesions was higher in GCP group than combination group at 18 and 24 months and the differences were statistically significant (P = 0.012 and 0.005, respectively). The efficacy of pit and fissure sealants depends mainly on penetration into deep micropores and retention of sealing materials. Previous studies have shown that resin-based (Seal It) and ionomer-based (GCP glass seal) fissure sealants were successful in the prevention of dental caries., To the best of our knowledge, no previous studies compared their efficacy in a clinical trial. The present clinical trial designed to evaluate the efficacy of infiltrant alone and in combination with Seal It for the prevention of pit and fissure caries and to compare its efficacy with Seal It and GCP glass seal. In the present study, the combination between ICON and Seal It carried out as the two materials are chemically compatible and mechanism of their application is nearly similar while the combination between ICON and GCP glass seal was not applicable. Most of the studies on sealants have used the half-mouth designs in which teeth on one side of the mouth were treated, and teeth on the other side left untreated; however, due to ethical reasons, untreated teeth not used as controls. In the present study, every child received sealants on all four first permanent molars. The study sample was the same for the four treatment modalities to ensure equity in all factors, which may affect the results. All the four treatment modalities included equal number of molars in upper and lower jaw as well as the right and left side, thus ensuring that any bias of placing the same sealant material either on maxillary or mandibular first permanent molars or placing the same sealant material on one side (either on the left or right side) was removed. During 1, 3, and 6 months follow-up evaluations, there were no significant differences among the four sealant modalities regarding sealant retention and new carious lesions. These results showed that the efficacy of these different modalities is consistent with the results obtained by conventional sealant to prevent pits and fissures caries. The 12, 18, and 24 months follow-up intervals showed significant differences among the four treatment modalities regarding sealant retention and caries incidence, these differences may be due to variation in retention and resistance of the materials to degradation by occlusal forces. The penetration of infiltrant into the deep pits and fissures can be affected by the morphology of the fissures and the lesion position within it, complete cleaning and conditioning of deep narrow fissures is almost impossible. Furthermore, deep fissures allow entrapment of air in occlusal lesions after acid etching and water rinsing.,, Therefore, the results of the present study indicated that treatment with ICON alone for the prevention of pits and fissures caries should not be recommended for dental practice. The results of the present study disagreed with the results obtained by Anauate-Netto et al, the difference in these results may be due to application of infiltrant in the present trial on sound as well as non cavitated carious lesions while in Anauate-Netto et al study, the application of infiltrant was done for non cavitated carious lesions only. It was known that, the resin infiltrant was developed to arrest non cavitated carious lesions of the proximal surfaces, it allows the diffusion barrier to be shifted from the enamel surface towards the lesion body. So the infiltrant may give best results when applied on non cavitated carious lesions not sound molars., Thus, the results from artificial lesions could not be directly applied to pits and fissures carious lesions. The ages of children in the present study were different from Anauate-Netto's study; children participated in the present study were aged between 6 and 8 years with newly-erupted permanent first molars which lead to difficult isolation of teeth and application of rubber dam. The results of the present study also confirmed that the efficacy of infiltrant was comparable with GCP glass seal [Table 3]. At the end of the trial, a complete loss of sealant occurs in the two groups (41 vs. 36) and the number of new carious lesions was not significantly higher in infiltrant (20 lesions) than PCG glass seal (13 lesions). The less number of new carious lesions in GCP compared with infiltrant may be due to no surface preparation before GCP glass seal application, loss of glass seal material leaves intact enamel surface, which is more resistant to caries attack than rough porous (etched) surface after degradation of infiltrant. In addition, the fluoride release by glass ionomer increases remineralization and antimicrobial activity against cariogenic microorganisms which results in increased resistance to caries attack. The nanoparticle-resin material (Seal It) is highly effective to prevent new carious lesions in pits and fissures and these results validate the previous in vitro results indicated that Seal It was the best sealant material as it had significantly least microleakage with high shear bond strength compared to GCP glass seal. The efficacy of Seal-It and combination modalities was similar at all follow-up intervals except at 18 and 24 months where the retention of the combination was better than retention of Seal-It alone [Table 1]. The better retention of the combination modality may be due to good penetration of infiltrant that ensures deep diffusion of unfilled materials into micro-pores created by the hydrofluoric acid etchant. In addition to that, covering the surface with Seal It protects the infiltrant from dissolution by saliva or occlusal force. Although these results were statistically nonsignificant, still support the results obtained by Lausch et al. who observed that the combination of microfill resin and infiltrant seems to render the advantages of the micro-filled fissure sealant and the caries infiltration procedure. The better results in combination modality can be explained by the fact of etching regime used for the infiltrant procedure that can remove soft and hard tissues within the fissure and erodes the noncavitated lesion surface. The subsequent penetration of the infiltrant deeply into etched enamel might enhance the retention rather than superficial sealing procedure. These results are in accordance with the results obtained by Kielbassa et al. who described, that infiltrant and conventional resin combination improved the quality of fissure sealing compared with the use of a conventional fissure sealant alone and recommended its clinical use; particularly with initial carious lesions. Regarding the comparison between Seal It or combination modalities with ICON or GCP modalities [Table 3], the development of new carious lesions was more in ICON and GCP groups [Table 2], perhaps due to low wear resistance and rapid dissolution of ICON and GCP. The remaining/leftover penetrating material within fissures or small cavities offers the advantage to both Seal It and its combination with ICON, the infiltration of micro tags/the porous lesion body with dissolution resistant nanoparticle-resin sealing materials will remain even if the filling of the fissure or cavity is lost. This might arrest the progression of the caries process even if the sealing material does not remain intact. As speculated, the combination procedure improved the retention but ICON Seal It combination procedure takes more time almost double to the Seal It procedure; therefore, it seems less practicable in treating children. Although, the resin infiltrant is highly effective for prevention of initial proximal caries, the results of the present in vivo study confirmed that the use of the infiltrant alone in prevention of pits and fissures caries is not effective, but its combination with nanoparticle resin-based fissure sealants are more effective in the prevention of pits and fissures caries. The resin infiltrant and nanoparticle resin-based combination enhance their clinical efficacy in prevention of pits and fissures caries, but statistically, it was not significant, so further studies should be proposed to evaluate the efficacy of such combinations in the future. The usage of infiltrant alone in prevention of pits and fissures caries is not effective in prevention of pit and fissure caries. The resin infiltrant (ICON) and nano particle resin based sealant (Seal It) combination clearly improves their effectiveness in prevention of pits and fissures caries and is recommended for clinical use particularly for pits and fissures with initial carious lesions. The authors would like to thank the schools' administration for their help and cooperation during clinical examination and scheduling of the children to receive pit and fissure sealants application and follow-up. We are deeply thankful to Dr. Ahmed Al-Hdad, Pedodontist at Palteem Central Hospital for his help and the evaluation of pit and fissure sealants retention as well as caries incidence during different follow-up intervals. Nogourani MK, Janghorbani M, Khadem P, Jadidi Z, Jalali S. A 12-month clinical evaluation of pit-and-fissure sealants placed with and without etch-and-rinse and self-etch adhesive systems in newly-erupted teeth. J Appl Oral Sci 2012;20:352-6. Baldini V, Tagliaferro EP, Ambrosano GM, Meneghim Mde C, Pereira AC. Use of occlusal sealant in a community program and caries incidence in high- and low-risk children. J Appl Oral Sci 2011;19:396-402. Ripa LW. Sealants revisted: An update of the effectiveness of pit-and-fissure sealants. Caries Res 1993;27 Suppl 1:77-82. Pardi V, Pereira AC, Mialhe FL, Meneghim Mde C, Ambrosano GM. Six-year clinical evaluation of polyacid-modified composite resin used as fissure sealant. J Clin Pediatr Dent 2004;28:257-60. Yildiz E, Dörter C, Efes B, Koray F. A comparative study of two fissure sealants: A 2-year clinical follow-up. J Oral Rehabil 2004;31:979-84. Morales-Chávez MC, Nualart-Grollmus ZC. Retention of a resin-based sealant and a glass ionomer used as a fissure sealant in children with special needs. J Clin Exp Dent 2014;6:e551-5. Singh S, Pandey RK. An evaluation of nanocomposites as pit and fissure sealants in child patients. J Indian Soc Pedod Prev Dent 2011;29:294-9. Rabab S, Elkwatehy W. Evaluation the micro-leakage and shear bond strength of nano and conventional dental fissure sealants. Egypt Dent J 2016;62:1-9. Subramaniam P, Girish Babu KL, Jayasurya S. Evaluation of solubility and microleakage of glass carbomer sealant. J Clin Pediatr Dent 2015;39:429-34. Kantovitz K, Pascon F, Nobre-dos-Santos M, Puppin-Rontani R; Review of the effects of infiltrants and sealers on non-cavitated enamel lesions. Oral Health Prev Dent 2010; 8:295-305. Paris S, Meyer-Lueckel H. Infiltrants inhibit progression of natural caries lesions in vitro. J Dent Res 2010;89:1276-80. Borges B, de Souza Borges J, de Araujo L, Machado C, dos Santos A, Pinheiro I; Update on nonsurgical, ultraconservative approaches to treat effectively non-cavitated caries lesions in permanent teeth. Eur J Dent 2011; 5:229-236. Paris S, Lausch J, Selje T, Dörfer CE, Meyer-Lueckel H. Comparison of sealant and infiltrant penetration into pit and fissure caries lesions in vitro. J Dent 2014;42:432-8. Aziznezhad M, Alaghemand H, Shahande Z, Pasdar N, Bijani A, Eslami A, et al. Comparison of the effect of resin infiltrant, fluoride varnish, and nano-hydroxy apatite paste on surface hardness and Streptococcus mutans adhesion to artificial enamel lesions. Electron Physician 2017;9:3934-42. Swamy DF, Barretto ES, Mallikarjun SB, Dessai SS.In vitro evaluation of resin infiltrant penetration into white spot lesions of deciduous molars. J Clin Diagn Res 2017;11:ZC71-4. Prajapati D, Nayak R, Pai D, Upadhya N, Bhaskar KV, Kamath P, et al. Effect of resin infiltration on artificial caries: An in vitro evaluation of resin penetration and microhardness. Int J Clin Pediatr Dent 2017;10:250-6. Kielbassa AM, Ulrich I, Schmidl R, Schüller C, Frank W, Werth VD, et al. Resin infiltration of deproteinised natural occlusal subsurface lesions improves initial quality of fissure sealing. Int J Oral Sci 2017;9:117-24. Mejàre I, Lingström P, Petersson LG, Holm AK, Twetman S, Källestål C, et al. Caries-preventive effect of fissure sealants: A systematic review. Acta Odontol Scand 2003;61:321-30. Sebastian S, Johnson T. International caries detection and assessment system (ICDAS): An integrated approach. Int J Oral Health Med Res 2015;2:81-4. Deery C, Fyffe HE, Nugent ZJ, Nuttall NM, Pitts NB. A proposed method for assessing the quality of sealants – The CCC sealant evaluation system. Community Dent Oral Epidemiol 2001;29:83-91. Messer LB, Calache H, Morgan MV. The retention of pit and fissure sealants placed in primary school children by dental health services, victoria. Aust Dent J 1997;42:233-9. Feigal RJ, Musherure P, Gillespie B, Levy-Polack M, Quelhas I, Hebling J, et al. Improved sealant retention with bonding agents: A clinical study of two-bottle and single-bottle systems. J Dent Res 2000;79:1850-6. Paris S, Bitter K, Naumann M, Dörfer CE, Meyer-Lueckel H. Resin infiltration of proximal caries lesions differing in ICDAS codes. Eur J Oral Sci 2011;119:182-6. Rahiotis C, Zinelis S, Eliades G, Eliades T. Setting characteristics of a resin infiltration system for incipient caries treatment. J Dent 2015;43:715-9. Askar H, Lausch J, Dörfer CE, Meyer-Lueckel H, Paris S. Penetration of micro-filled infiltrant resins into artificial caries lesions. J Dent 2015;43:832-8. Anauate-Netto C, Borelli L Neto, Amore R, DI Hipólito V, D'Alpino PHP. Caries progression in non-cavitated fissures after infiltrant application: A 3-year follow-up of a randomized controlled clinical trial. J Appl Oral Sci 2017;25:442-54. Tay FR, Frankenberger R, Carvalho RM, Pashley DH. Pit and fissure sealing. Bonding of bulk-cured, low-filled, light-curing resins to bacteria-contaminated uncut enamel in high c-factor cavities. Am J Dent 2005;18:28-36. Meyer-Lueckel H, Paris S. Improved resin infiltration of natural caries lesions. J Dent Res 2008;87:1112-6. Lausch J, Askar H, Paris S, Meyer-Lueckel H. Micro-filled resin infiltration of fissure caries lesions in vitro. J Dent 2017;57:73-6. Doméjean S, Ducamp R, Léger S, Holmgren C. Resin infiltration of non-cavitated caries lesions: A systematic review. Med Princ Pract 2015;24:216-21. Komatsu H, Shimokobe H, Kawakami S, Yoshimura M. Caries-preventive effect of glass ionomer sealant reapplication: Study presents three-year results. J Am Dent Assoc 1994;125:543-9. Koenraads H, Van der Kroon G, Frencken JE. Compressive strength of two newly developed glass-ionomer materials for use with the atraumatic restorative treatment (ART) approach in class II cavities. Dent Mater 2009;25:551-6. Farrugia C, Camilleri J. Antimicrobial properties of conventional restorative filling materials and advances in antimicrobial properties of composite resins and glass ionomer cements-A literature review. Dent Mater 2015;31:e89-99. Ammari MM, Jorge RC, Souza IP, Soviero VM. Efficacy of resin infiltration of proximal caries in primary molars: 1-year follow-up of a split-mouth randomized controlled clinical trial. Clin Oral Investig 2018;22:1355-62.